Will Indiana’s transition to NMLS affect my collection agency license? Starting November 1, 2012 The Indiana Secretary of State Securities Division will be using the Nationwide Multistate Licensing System (NMLS) to manage collection agency licensing. NMLS will be used to apply for, amend, and renew all collection agency licenses. 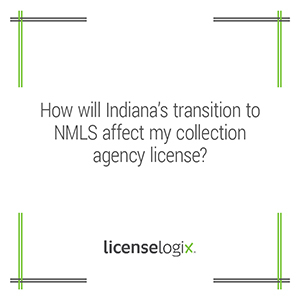 If you already have an active collection agency in Indiana, you will need to transition the license to NMLS at the time of the next business license renewal. If your company has not used NMLS before, you must submit a Company Account Request Form electronically through the “Getting Started Section.” Once this is complete, you will create a company record in NMLS for the company and each branch, and proceed to submit the license renewal electronically. If you are applying for a new collection agency license, you will follow the same steps as above and submit the new application electronically. Several original documents must be mailed to the Secretary of State after electronic submission such as the $5,000 surety bond, a copy of the agency’s home state license, and notarized questionnaire. Step by Step instructions along with a copy of the Division’s transition plan can be found on the NMLS Resource Center Website. For additional help you can click contact us, or give us a call at (800) 292-0909.